Developed in collaboration with BUCS ( British Universities and Colleges Sport) our Mental Health in Sport programme equips staff involved in Higher Education sport with the knowledge, confidence and skills to make sport at their university inclusive of individuals experiencing mental health difficulties. We also have a guide to help university sports staff and clubs support students’ mental health through physical activity. Accredited Mental Health First Aid training on Day 1. An overview of student mental health and the challenges that students face. Best practice for setting up accessible and inclusive sports programmes, including referral programmes for students between support services and health/exercise services. An overview of the Mental Health in Sport workshop. This equips you to run training for your own sports clubs and teams in mental health awareness. 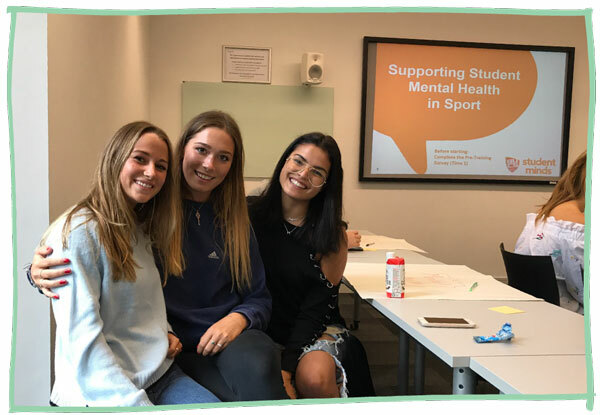 You will learn how to run the Mental Health in Sport workshop which trains students how to recognise and support teammates experiencing mental health difficulties, and covers creating an action plan for an inclusive club culture. Boundaries for staff and managing conversations with students. Advertising the Mental Health in Sport workshop on campus. Trainer requirements, including impact measurement and publicity tips. Please note, you must attend the full two days of training to become an accredited Mental Health in Sport trainer. Following the training, you will be supported by a member of staff at all times to help you get up and running. You will be expected to run at least one Mental Health in Sport workshop at your institution per year, and you will receive a number of resources (available on our Trainer Hub) to help you run the programme successfully. We also offer Continuing Professional Development events to ensure you remain secure in the knowledge, confidence and skills to deliver successful Mental Health in Sport workshops. Please see FAQs at the bottom of this page for more information. If you would like book onto one of our training courses please follow the link below. More dates will be announced soon! If you would like to hear about future training dates, please register your interest by following the form link. Registration closes 2 weeks before the training. If you have any questions, please email training@studentminds.org.uk. Our Mental Health in Sport programme costs £315 per person (plus an annual £50 membership and licensing fee per person - please see FAQs at the bottom of this page for more information). If you’re interested in requesting in-house training please email training@studentminds.org.uk. ​You can pay via the PayPal link below or we can issue you with an invoice, which is payable in advance of the training course via BACS. Unfortunately we are unable to accept payment over the phone. What feedback have we received? 46% increase in their knowledge of the issues surrounding student mental health. 83% increase in their knowledge of best practice in supporting mental health within Higher Education sport. 64% increase in their confidence to train sports clubs and teams at their university in mental health awareness. 88% rated their skills as good or very good to run Mental Health in Sport workshops at their university. "The trainer was brilliant and answered all questions whilst also making us feel very comfortable throughout the course. The course content was all relevant and useful... [it] referred to student life in all examples making it easy to relate to." Our current trainers include sports participation staff, sports development staff, club development staff and BUCS coordinators. Unfortunately we are unable to train students who are currently studying, and this includes students with part-time welfare-related roles. Instead, you may be interested in reading our University Sport and Mental Health Guidance document. If you have already completed Mental Health First Aid England training, please contact training@studentminds.org.uk. The price of the two-day course is £315 plus an annual £50 fee. You can pay via the PayPal link above or we can issue you with an invoice, which is payable in advance of the training course via BACS. Unfortunately we are unable to accept payment over the phone. Where is the Oxford training venue? Our training takes place on the first floor of the Turl Street Kitchen (16 - 17 Turl Street, Oxford, OX1 3DH). Please note, there is no lift. If you have any access requirements please get in touch with us as soon as possible. Turl Street Kitchen is a 10-15 minute walk from the train station and a 5 minute walk from the bus station. You can find a list of car parks here but please bear in mind that parking in central Oxford can be difficult and often expensive. Unfortunately we are unable to provide any accommodation. Can I attend MHFA England? Please note: The Mental Health First Aid training we deliver is a product developed by MHFA England. If your institution is based outside of England, the MHFA accreditation may not be valid in your region. Our student workshop is suitable for all Higher Education institutions, so is not limited to England. For more information, contact training@studentminds.org.uk. - Trainers must have attended the full two-day Student Minds training prior to running Mental Health in Sport workshops. - Trainers must deliver a minimum of one Mental Health in Sport workshop at their institution within one year of being trained. The course cannot be run for profit. Trainers are also required to renew their membership annually by completing the required MHIS refresher training online and paying the annual membership and licensing fee. - Trainers agree to register all Mental Health in Sport workshops with Student Minds and use the registration form provided for attendee sign ups. After each workshop, trainers must provide attendance data, trainer feedback and attendee feedback to Student Minds, following the Impact Measurement Guidelines outlined by Student Minds. - Provide trainers with the resources, support and content outlined in the membership and licensing fee terms (see below). - Circulate information about any content changes or updates to all accredited trainers. - Maintain systems for registration and feedback of attendees and reporting of data. What are the terms of the membership and licensing fee? - Access to free online training modules to ensure you remain secure in the knowledge and confidence to deliver effective workshops and to develop your skills further. - Updates and workshop amendments based on feedback from staff and students. - Access to ongoing support from a dedicated and experienced member of staff. - Webinars and video conferencing opportunities to improve your confidence in running workshops and to learn from others’ experiences across the network. - Exclusive use of a specific portal for trainers which includes: all the resources required to deliver workshops; advertising and publicity materials; templates for workshop promotion; along with previews of Student Minds’ resources, research and publications; and latest news from Student Minds and the sector. - Dedicated impact profiles for your institution, showing data and feedback from workshops that have been run.